Recently, we published a review on theory and experiment for electrokinetics with soft and charged interfaces. Our paper discusses the governing physics, modeling, and experimental verifications of theories for electrokinetics on soft and charged interfaces. To codifiy this understanding, we connect the cognate electrokinetic phenomena using the electrokinetic coupling matrix. Descriptions of soft and charge interfaces deviate from classical theories of electrokinetics by postulating a porous charge layer at the interface between the completely impermeable wall and pure fluid. In this interfacial region, a large amount of charge may be attached to the porous layer. 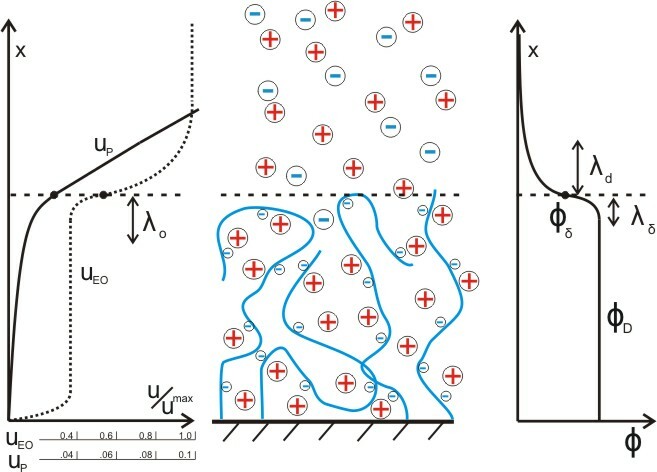 Depending upon the permeability of the porous layer, immense amplifications of electroosmosis, streaming potential, and/or conductance may be realized. Changes in these phenomena are not explained using rigid-surface electrokinetic theories. Descriptions of soft and charged layers are essential to understand and predict the behavior of systems with non-rigid interfaces bearing fixed charge. Soft and charged interfaces are present in a variety of systems, both synthetic (e.g., polymer exchange membrane, grafted polymer layers) and natural (e.g., cartilage, lipid membranes). We hope the theories and experiments discussed in the review provide researchers with a framework to interpret and plan results and experiments.